Sign Up for Class Info! All the classes are filled for the 2018-19 season! If you want to get on the mailing list for 2019-20, sign up in the form on the right side of the page. Then, when new class information is ready, you'll get the email notice. The next classes will be scheduled late fall 2019. Get your blood moving and smack some hot metal! Gift certificates available! Call 920-499-4027 with questions. All classes take place in my blacksmith shop, so you're surrounded by the tools and materials I use daily. Attendees should be 15 years of age or older. Just click on a class button below and you can register for a class right from this page. Classes can fill up quickly (honest), so register soon! I hope to see you this winter! We'll make sparks and squish some hot metal. Here's the class breakdown. Click on a link to go to the longer description and see dates and times. Take your pick of one or more whole-day classes. This is an informal introduction to blacksmithing that gives you a chance to get some basic instruction and try your hand at blacksmithing in a real blacksmith shop with all the tools and materials provided. After a short orientation and demonstration you’ll start out making some simple hooks to get the feel of working with hot steel and tools. After that you can choose from a number of projects with instructions or work on a project of your own design within reason. You can expect to take home several small projects. Some examples of projects you can make are hooks of various styles and sizes, letter knife, steak turner, fire poker, railroad spike knife, railroad spike hatchet, bottle opener, grill skewers, cheese cutter, candle holder, trivet, simple jewelry, fire steel/flint striker. No prior experience is needed for this class. Click on a class button to start the sign up process. Participants must be 15 years of age or older. Registration is first come first serve. Payment is required at the time of registration. No refunds starting one week before class date. Registration can be transferred to another person. Payment is by Paypal or credit card. Check the sign up deadline in the class descriptions. COST: $150 per person, all materials and use of tools included. 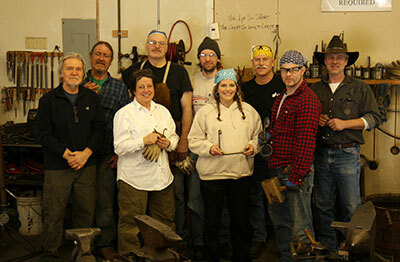 Blacksmithing 101 is for anyone who already has some experience or just really wants to pursue blacksmithing. This two-day course is structured to give students exposure to the fundamentals of forging steel with class time and plenty of hands-on forging time in the shop. Students will make simple tools and then use those tools to make more complex projects. The focus is on understanding the principles of the various techniques used in blacksmithing and using them to create tools and projects. There will be an introduction to basic metallurgy and heat treating tool steels. In this class the student will learn to draw a taper, upset, twist, punch, slit, rivet, and several different aspects of forging. Projects to take home include a punch, chisel, tongs and several decorative elements. The class is limited to 4 students ensuring plenty of one-on-one instruction time. We start at 8am, break for lunch (provided by Benson Designs) from 12-1pm, then work until 5pm. Each participant receives a study guide that includes descriptions and illustrations of things covered in the class, as well as a resource list. Click on the class button to start the sign up process. Participants must be 15 years of age or older. Registration is first come first serve. Payment is required at the time of registration. No refunds after one week before start date of class. Registration can be transferred to another person. Payment is by Paypal or credit card. COST: $480 per student for 2 consecutive class days. Maximum 4 students.